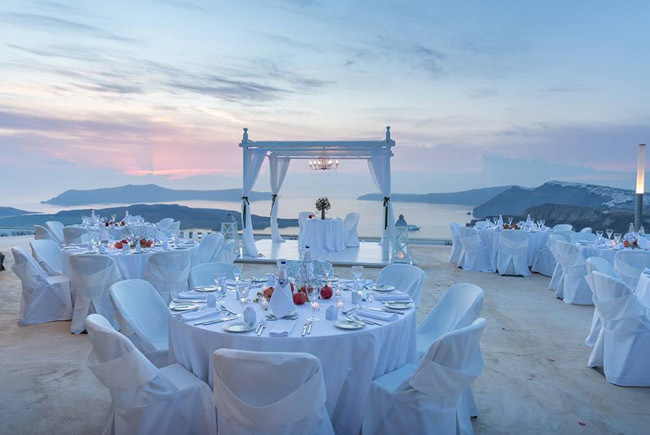 Get married in Santorini. Santorini is one of the most prestigious and sought after venues on the island, with unique views to the Caldera and the famous Volcano surrounded by the deep blue of the Aegean sea. The Gem is a magical place for the wedding of your dreams. 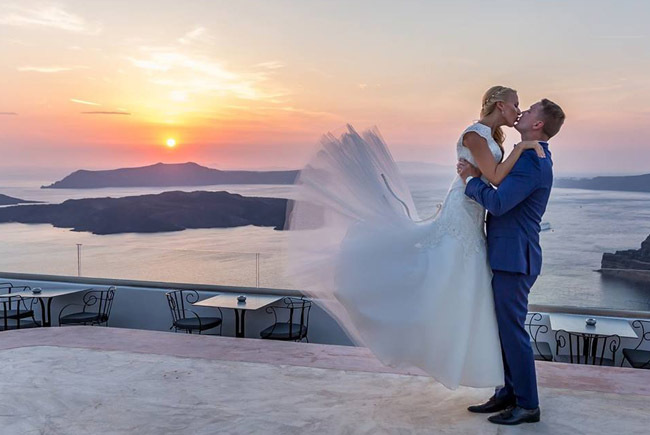 Picture your idyllic wedding in Santorini and enjoy your civil or symbolic ceremony, overlooking the magnificent Caldera cliffs and the sparkling turquoise sea. Say “I Do” with the backdrop of a serene and romantic sunset. 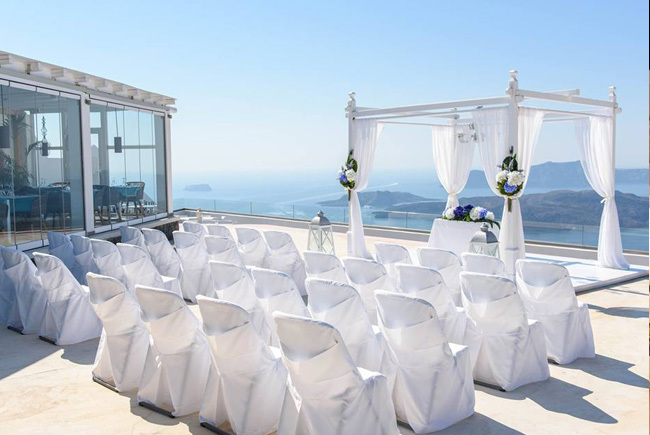 Private Bridal Preparation room with private bathroom, Ceremony on the highest point of the property. 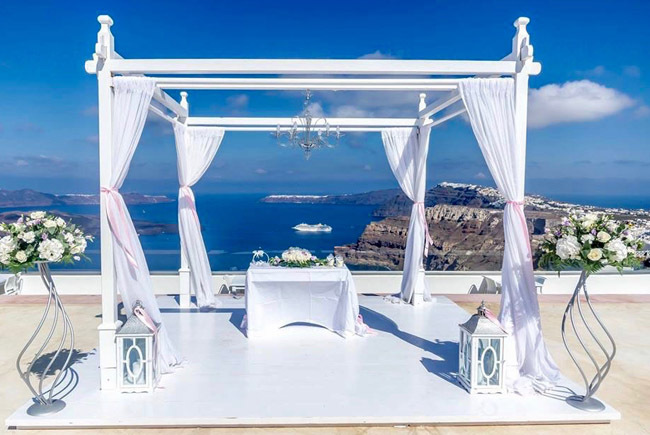 Santorini is listed as one of the world’s top wedding destinations. 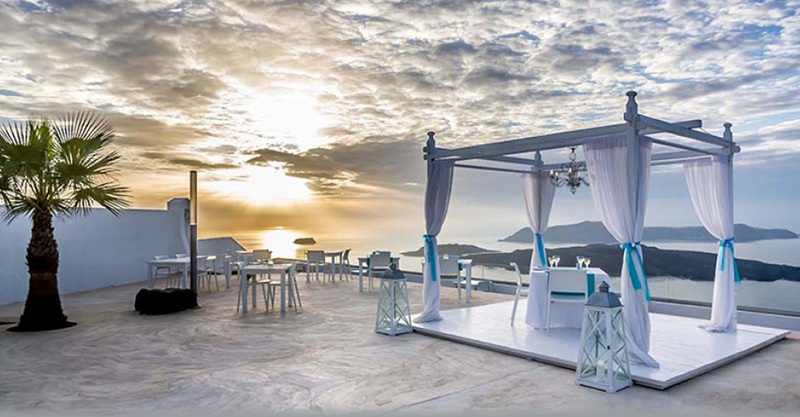 Let us indulge you and your guests the Greek way: with friendly hospitality, traditional flavours and impeccable service at this stunning venue with breathtaking views. 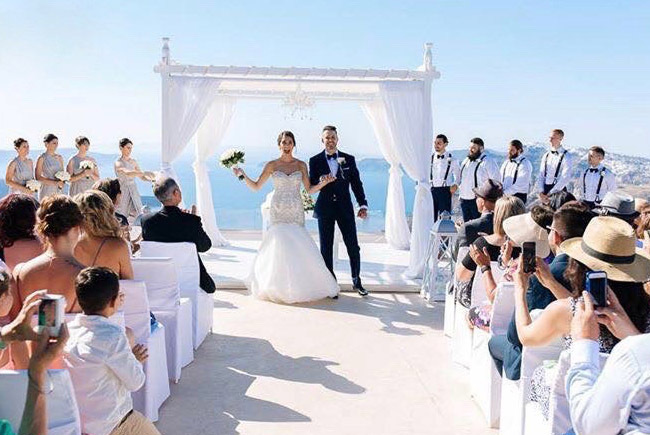 Bridal room (optional / extra fee of €100): 1h prior to the ceremony and for the duration of the ceremony. Air condition, full length mirror, sofas, coffee table, bathroom with shower, bottled water is provided. Description: Exchange vows in the Caldera among friends and relatives. Celebrate your special day in a cocktail or dinner party! Equipment, facilities & services included: Wooden wedding Gazebo with white curtains on all four sides White altar table Altar’s chandelier Large lanterns with candles (lit after sunset) White covered chairs for your guests Sound system Round / rectangle tables Guests’ bathroom facilities Bridal room (optional / extra fee of €100): 1h prior to the ceremony and for the duration of the ceremony. Air condition, full length mirror, sofas, coffee table, bathroom with shower, bottled water is provided. 1. Buffet i €85 p.p. 2. Buffet ii €95 p.p. 3. Buffet iii €95 p.p. 4. BBQ buffet €115 p.p. 5. Luxury Buffet €140 p.p. Sit Down Menu – Under 70 guests *Selected Sit Down Menus: 1. Sit down menu i €70p.p. 2. Sit down menu ii €75 p.p. 3. Sit down menu iii €80 p.p. 4. Sit down menu iv €90 p.p. 5. Traditional sit down menu €60 p.p. 6. Luxury sit down menu €120 p.p. Description: Exchange vows in the Caldera among friends and relatives. Celebrate your special day in a cocktail or dinner party by the pool! For the selection of Menu, please advise and chose among the following: Buffet Menu – Over 50 guests *Selected Buffet Menus: 1. Buffet i €85 p.p. 2. Buffet ii €95 p.p. 3. Buffet iii €95 p.p. 4. BBQ buffet €115 p.p. 5. Luxury Buffet €140 p.p. Sit Down Menu – Under 70 guests *Selected Sit Down Menus: 1. Sit down menu i €70 p.p. 2. Sit down menu ii €75 p.p. 3. Sit down menu iii €80 p.p. 4. Sit down menu iv €90 p.p. 5. Traditional sit down menu €60 p.p. 6. Luxury sit down menu €120 p.p. * Please note that more of your friends could enjoy brunch, at previous notice and additional cost of €30 p.p. Description: Enjoy more, worry less! 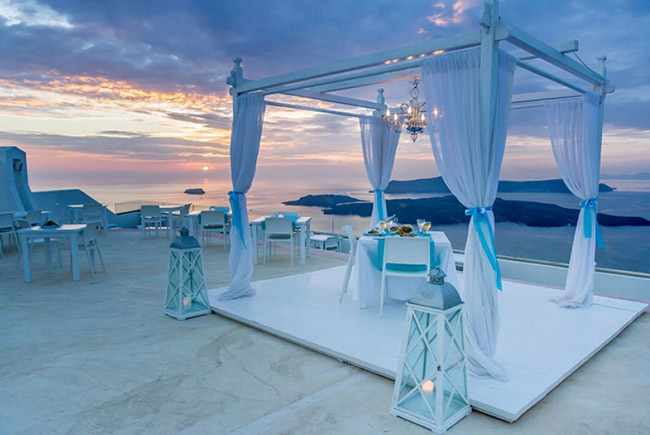 Indulge yourself with a full Santorini Gem hospitality, taking advantage of our best offer! 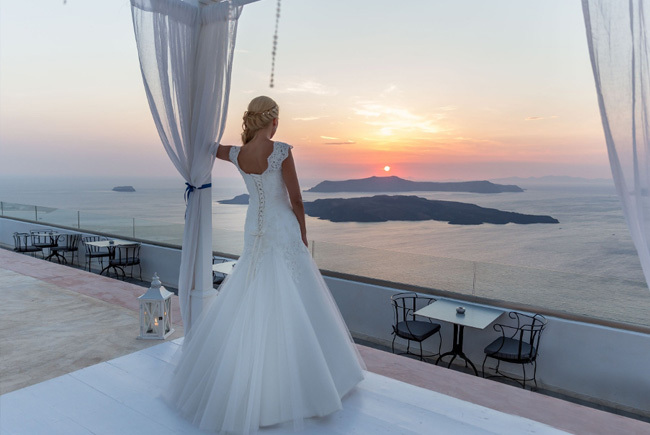 Located in Volcanic Caldera Santorini, Greece, famous for breathtaking views and sunsets! Wedding villa: 4 bedrooms, sleeps 8, 4 bathrooms, 2 living rooms, kitchen, dining space, equipped office, balconies, air conditioning, WiFi, pool, gardens. * Please note that more of your friends could enjoy brunch, at previous notice and additional cost of 30€ p.p. Night security service. We have testimonials for our Beach Weddings documenting and spanning over a decade and continue to do so to this present day. Check out a selection of the latest. We have a photo gallery of our fantastic Beach Weddings spanning over a decade and continue to do so to this present day. Check out a selection of the latest!